Welcome to my home page. If you're interested in strange topics such as four dimensional shapes and ridiculously large numbers, then you come to the right place. Last updated June 9, 2018. 2018 June 9 - New content on polychoron site including the final two remaining categories. A fun page called Strange Glossary complete with some audio clips. I also added the Elements page, it's not finished yet, but it's far enough to add online. I've also added browser icons for several of my web pages. 2016 September 29 - New content on polychoron site. Including an updated Stellachoron Nets Version 2 on the downloads page and a new page called Making Polychora which gives instructions and animated GIFs on how to build some of these four dimensional objects if you can make it to four-space. 2016 February 1 - New content on polychoron and polypeton sites. Added downloads page which includes polytope spreadsheets and Stella files of star polychoron nets. New content on Big Number Central including the new pententrical and oblivion pages and several new numbers on the infinity scrapers page with a new largest number Utter Oblivion. Also new content on the Forever Endeavor story. 2014 April 22 - New content on polychoron and polyteron sites. Added polypeton site. A new page about my brother's knotboxes. Some changes to the home page and polygon page. 2013 September 12 - New Polyteron of the Day site. 2012 June 10 - Lots of new content on the polychoron site, and I mean LOTS!!!. Added lower dimensional hubs (polyhedra, polygons, etc.). Added part to Forever Endeavor story, modified this page a bit, added Graphics page to the Artistic Pages section. 2010 October 25 - Big Number Central created, includes hypernomial page, trientrical and tetrentrical array pages. Changes on the Polychoron site, high res pics for categories 1-4. 2009 February 8 - Polyteron site is here!! !, also new content on polychoron site. Updated worlds page - 2003 EL 61 was finally named too - Haumea. 2008 August 23 - New content at the polychoron site, also added content to this page, as well as updated worlds of the solar system page - 2005 FY 9 is finally named - Makemake! 2008 July 3 - Added Welcome to the Fourth Dimension and Forever Endeavor stories as well as some crazy cartoons from my Another Reality series. 2008 March - Updated array notation and infinity scrapers pages, defined meameamealokkapoowa oompa. 2007 December - Updated and fixed a link to the Existence of God page. Name: Jonathan Bowers, AKA Hedrondude. Other Interests and Hobbies: Element collecting, planets and other worlds, gigantic numbers, drawing cartoons, video games, movies, unusual fruits, geometric computer graphics, building polyhedra, and Fushigi. Below is a picture of my Polyhedron Dude logo. To the right is a picture of a cross section of a four dimensional face. If you like my site, feel free to make a donation through Pay-Pal using my e-mail address "hedrondude at suddenlink dot net". Here's a list of my various pages. Polychoron Web Site - New Content! June, 2018 This is one of my most popular sites, it has been enhanced with new graphics including the vertex figures. This site deals with uniform and scaliform polychora and other interesting four dimensional shapes. Polyteron Web Site - Last updated April, 2014 This site parallels my polychoron site - but this time its going 5-D.
Polyteron of the Day - Created Sept. 2013 This site reveals a field of poke sections and the vertex figure of several uniform polytera. Polypeton Web Site - Last updated June, 2018 This site is the 6-D version of my polychoron site. Polytwisters - This page describes the strange swirling 4-D objects that are related to polyhedra in the same way a circle is to a line segment. Polytwisters don't have vertices, they have equaters that swirl around each other. Their sides aren't flat, but are cylindrical. If one was placed on a 4-D table it would roll, no matter how you placed it. 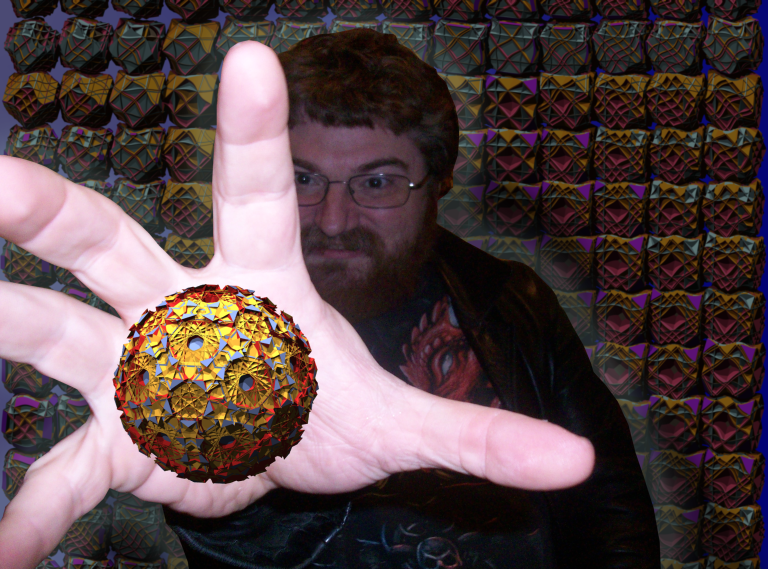 So in a way, these are rollable twisted "polyhedra" in four dimensions. Polyhedron Web Site - This site deals with shapes a little closer to home, the third dimension. Polygon Webpage - This page goes down to two dimensions, you'll also find links that will lead to the first and then zeroth dimension. Downloads Webpage - This page has several polytope based spreadsheets that can be downloaded. It also has a zipped file of over 80 star polychora showing what the pieces and the nets look like that can be viewed on Stella 4-D or Great Stella. Currently Stella can't make nets of star polychora, so using a few tricks, I solved for the nets of these 80 plus "stellachora". Big Number Central - Last updated February, 2016 - Due to the popularity of my Infinity Scrapers and Exploding Array Function pages, I've created a main hub page with a few new pages detailing these giant numbers and the exploding array function to make it easier to follow through. Exploding Array Function - Last updated March 2008 This page deals with my Array Notation which I now call the Exploding Array Function - this is a function that generates some of the largest finite numbers known. Compare the old version which has 5 rules for only the simplest arrays with the newer version which has only 3 rules for any kind of array. Infinity Scrapers - Last updated February, 2016 This page will introduce some extremely outrageous sized numbers that make googolplex look pathetic, I've added many new number names, some of the numbers have been redefined. This page will introduce numbers such as tetratri, gongulus, kungulus, big boowa, big hoss, meameamealokkapoowa, and for the first time oblivion and utter oblivion. These numbers are so big that adjectives like "giant", "super", and "catastrophic" do them no justice, we would need new words like "gongulacious" or "kungulacious". Illion Numbers - Here's an extended list of numbers with the -illion suffix, this list goes past a googoltriplex. Some names have been modified, also there are some new illion numbers here. Spaces - Coming Soon - it was delayed due to a hard drive failure May 2014. This page will explain array spaces and their prime blocks in more detail using a Jack in the Beanstalk analogy to describe the climbing method. Chemical Elements - Partially finished - June 2018 What are the elements really like, I'll describe them from an element collector's point of view, expect some humorous comments, ex. (holmium could be described as "petrified lead", and scandium could be described as "darth aluminum"
Worlds of the Solar System - Last updated Aug. 2008 This page describes all of the known worlds (planet-like objects) in our solar system (planets, large moons, dwarf planets). I'll be adding some much needed pics soon. Existence of God - Last updated Dec. 2007 Ever asked that question "How did God get here?, or "Why does He exist? ", or "is there a logical reason to believe He exists? ", this page may reveal that answer. Truth Theory - Coming Soon This page will attempt to describe what holds all things together and what properties it must have. I've been pondering this for some time now. It will be a sequel to Existence of God page. Thoughts of Heaven - In the Future This page will attempt to uncover what the real Heaven is like, and expose the boring stereotypes as false. If you expect this page to be warm and fuzzy - beware - it will be cutting edge and full of adrenaline and wonder! Knotboxes - Added April, 2014 Here are some interesting glowing wooden objects that my brother Jeff has made. Another Reality - Added July 3, 2008 Wanna see my goofy side, take a look at these off the wall cartoons I drew during the 90's and up to the present. Graphics - Added June, 2012 Here are some examples of graphics that I have done while exploring the polychora. Welcome to the Fourth Dimension - Added July 3, 2008 Some time ago I started to write a story about a man who stumbled into a four dimensional world - Here are the first two chapters. Forever Endeavor - New Part added February 1, 2016 I also started writing another story about a man named Mr. Bentley who found an opportunity to earn a million dollars. All he needs to do is build ten counters, he must stay there until the job is complete. After starting this job to make the counters with a mysterious co-worker named "Compadre" who never speaks, but has a frightening stare, he found out that it would take MUCH longer than he could ever imagine. Strange Glossary - NEW!! June, 2018 Here are some terms, phrases, and fun mispronounciations that my family and I have came up with through the years - some sound cool, some are outragiously silly, there are some audio clips also - first time for my website. Crazy Fruits - Coming Soon Back in 1994, I started to research exotic fruits, during this time I drew several made-up fruits for fun, all having cool or crazy names like spinakerfruit, frogfruit, vemaplacina, and quosapina - I'll have these drawings with descriptions here. - Note, the fruit on this page don't exist, they're here for fun. Characters - In the Future Here I'll introduce some of the many characters that I've come up with over the years - such as Jabe, Frisky, Pathetisaur, Kamone Punk, and Dorky Duke.